Native to southern Africa (i.e. Mozambique, South Africa and Swaziland). 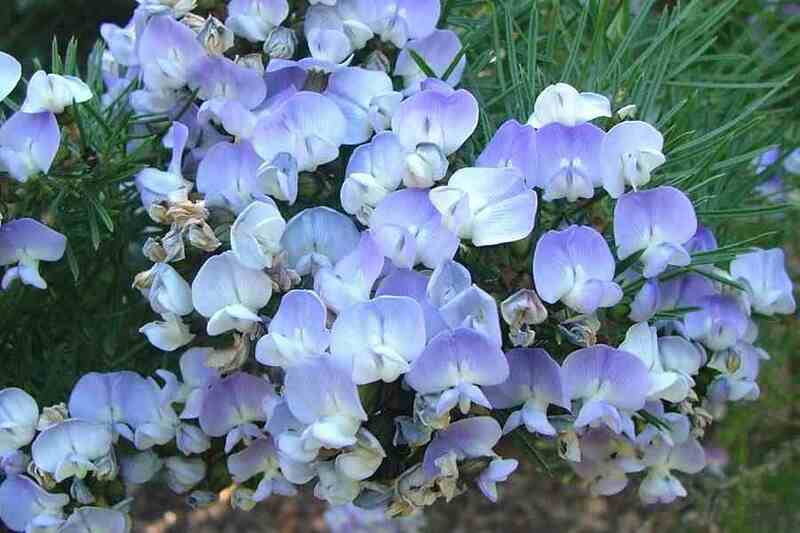 African scurf-pea (Psoralea pinnata) has been widely cultivated as a garden ornamental, particularly in the temperate regions of Australia. Widely naturalised in the coastal and sub-coastal districts of southern Australia (i.e. in eastern New South Wales, Victoria, Tasmania, south-eastern South Australia and south-western Western Australia). Also present in some inland parts of northern New South Wales. Naturalised overseas in New Zealand. 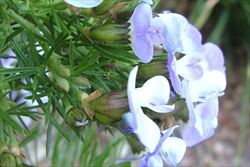 A weed of riparian vegetation, swamps, coastal environs, heathlands, grasslands, shrublands, open woodlands, rocky outcrops, roadsides, disturbed sites and waste areas in the temperate regions of Australia. An upright (i.e. 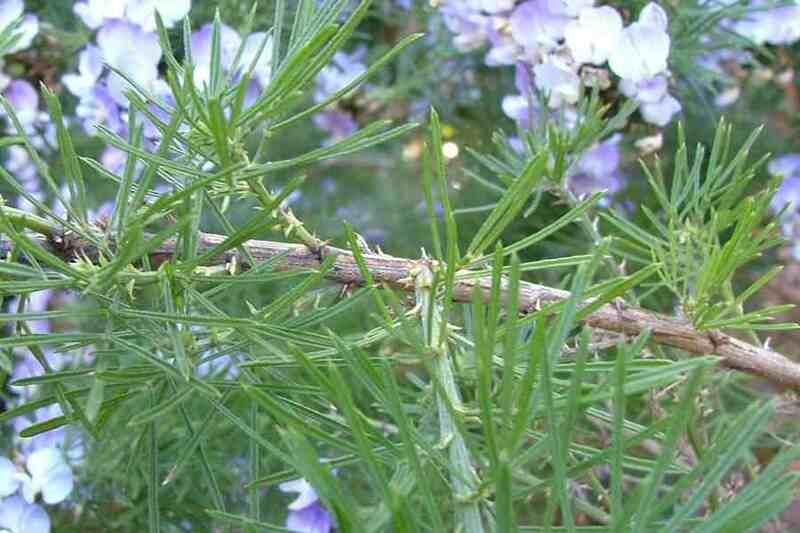 erect) shrub usually growing 1-3 m tall, but occasionally reaching up to 5 m in height. an upright shrub usually growing 1-3 m tall. 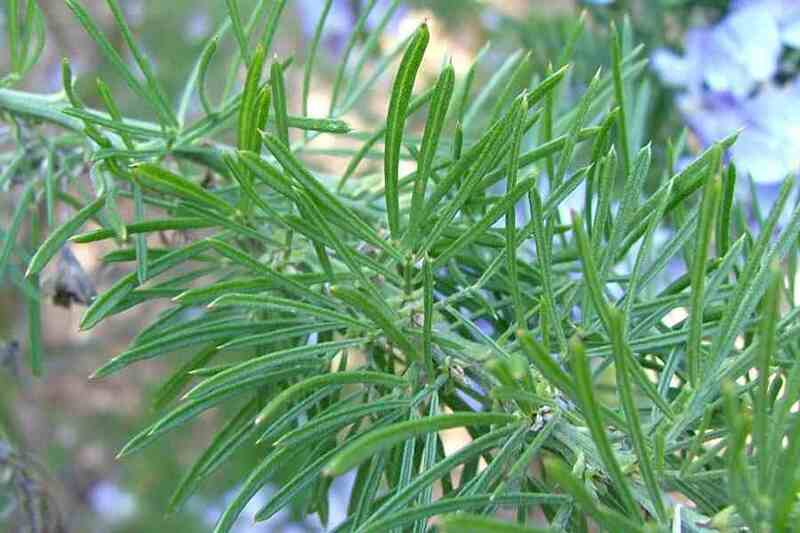 its once-compound leaves tend to be crowded towards the tips of the hairless or slightly hairy branches. these leaves (2-5 cm long) have 5-11 leaflets very narrow leaflets (2-4 cm long and only 0.8-2 mm wide). 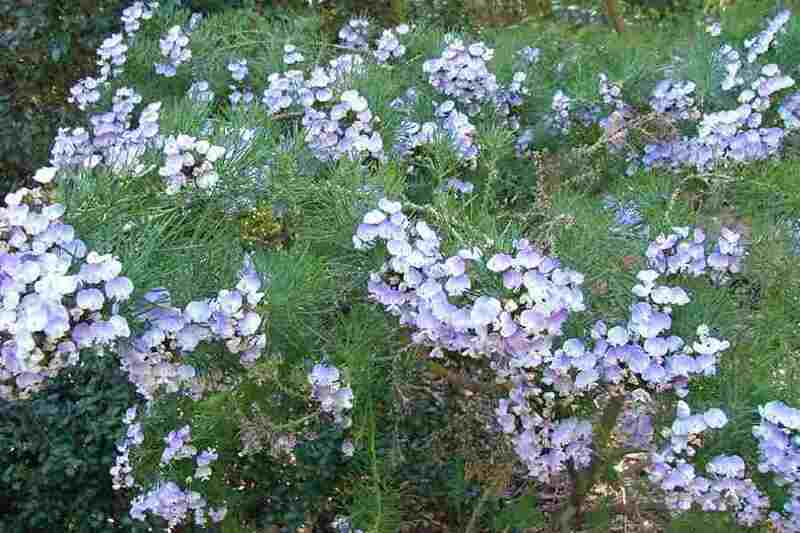 its pea-shaped flowers are (up to 18 mm long) are white with blue or purplish markings. its small egg-shaped pods turn (4-5 mm long) turn blackish as they mature. 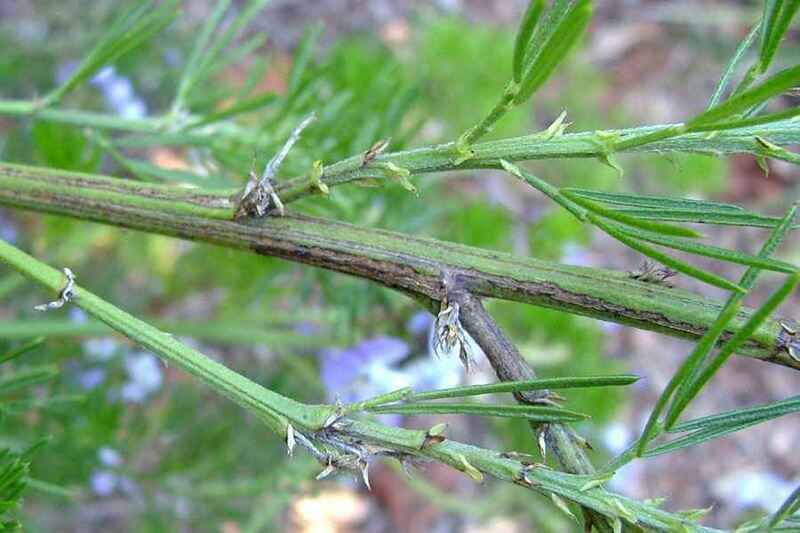 Its younger stems are either hairy (i.e. pubescent) or hairless (i.e. glabrous) and are slightly ribbed (i.e. striate). The once-compound (i.e. pinnate) leaves are alternately arranged, but tend to be crowded towards the tips of the branches. These leaves (2-5 cm long) have 5-11 leaflets and are borne on stalks (i.e. petioles) 2-7 mm long. The very narrow (i.e. linear) leaflets (2-4 cm long and only 0.8-2 mm wide) have entire margins and pointed tips (i.e. acute apices). Their upper surfaces are channeled, while both surfaces are somewhat hairy and dotted with small black spots. 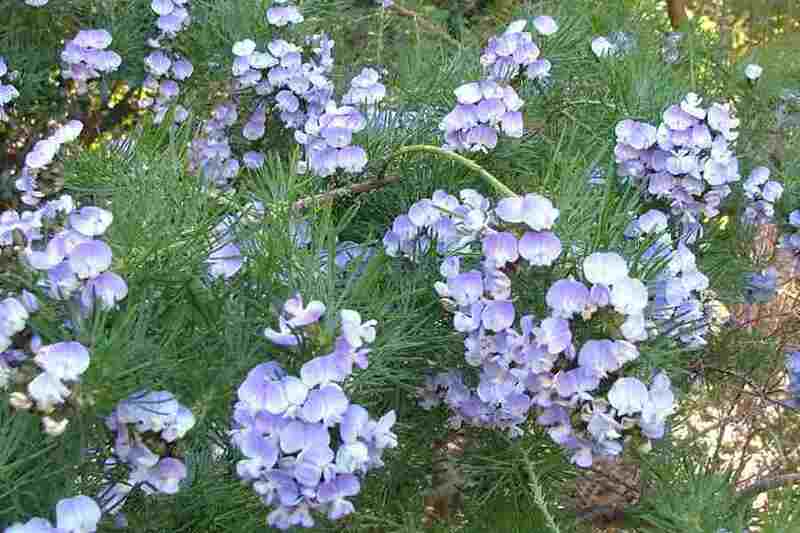 The pea-shaped flowers are borne singly or arranged in small clusters in the leaf forks near the tips of the branches (i.e. in small axillary racemes). These flowers are borne on stalks (i.e. pedicels) 3-15 mm long and have five sepals (5-8 mm long) that are fused together at the base (i.e. into a calyx tube). The flowers also have five petals (up to 18 mm long) that are mostly white with blue or purplish markings. The uppermost petal (i.e. standard) is larger than the two side petals (i.e. wings), while the two lowermost petals are fused together and folded (i.e. they form a keel). The flowers also have ten stamens, nine of which are fused together with the other being separate from the rest, and an ovary topped with a style and stigma. Flowering occurs mainly during spring and summer (i.e. from October to March). The small egg-shaped (i.e. ovoid) pods turn from green to black in colour as they mature. These fruit (4-5 mm long and 2.5-3 mm wide) do not split open when mature and contain shiny brown seeds. This species reproduces mainly by seed, which are dispersed by water, in contaminated soil, and in dumped garden waste. 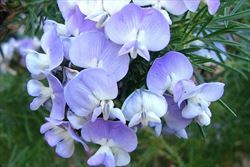 African scurf-pea (Psoralea pinnata) is regarded as an environmental weed in Victoria, Tasmania, New South Wales and Western Australia.